It’s a norm that we all rely on Facebook to be reminded of the birthday of our friends, colleagues and not forgetting, our enemies as well. 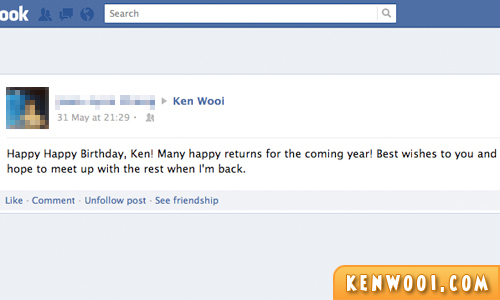 Well, who in his/her right mind would actually remember a friend’s exact birthday? It’s rare nowadays, to be exact. Yeap, we casually wish them. A simple and short greeting would do. That friend must be tremendously touched by the birthday wish, I’m pretty sure. 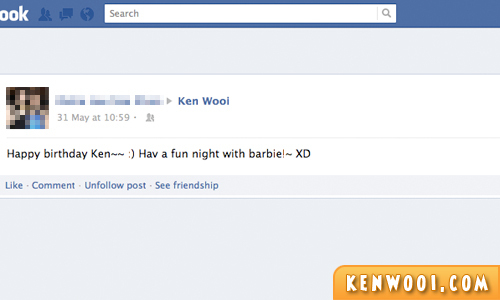 So, I decided to perform an experiment on Facebook. I changed the date of my birthday and wanted to see how many friends would wish me because of Facebook. 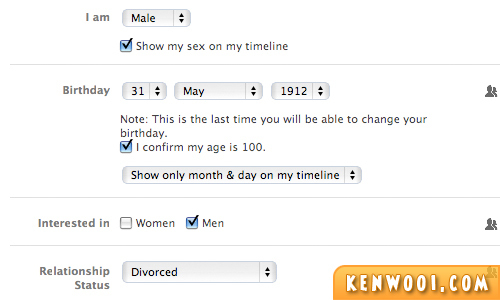 If you’ve been reading kenwooi.com for some time, you would know (or maybe not, because it’s not important anyway) that my birthday falls in July, not May – not 31 May 1912. So I patiently waited till that day, and when the clock struck twelve – RELEASE THE TITAN WISHES!!! He wished me and called me boss, but I don’t own a business and I employ no one. Okay wait, maybe I’m bossy – that’s why he called me that. Damn. It’s my birthday, and I get told to party hard. But I don’t drink, I don’t go clubbing – so how to party hard? I like this guy – he’s a senior of mine in high school. 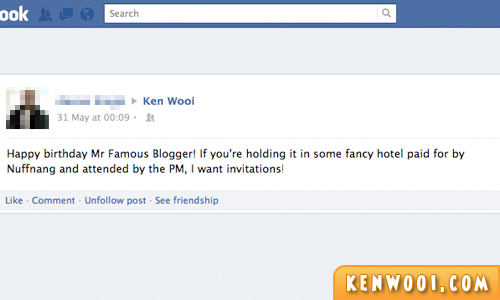 But dude, I may be famous to you, but unfortunately I’m not famous enough to get invited to some fancy hotel and meet the PM. Furthermore, I have no chance to give out invitations. Sorry, boss! This friend wished kenwooi.com instead of me. Hmph! This is a quick one. TQ! Oh well, and at the end of the day, nobody even showed signs that they realize I faked my birthday on Facebook. 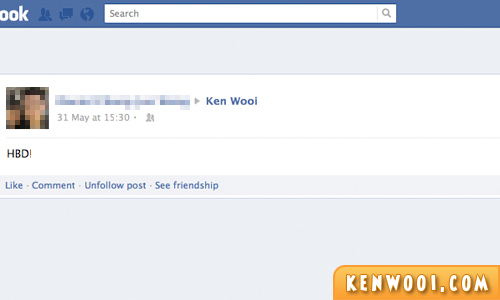 Quite a number of friends wished me just because Facebook told them so. 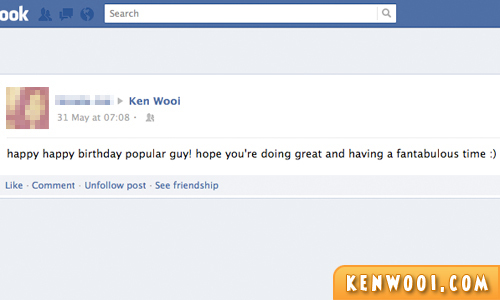 This experiment actually proves and confirms that people completely rely on Facebook for birthday wishes nowadays. To think of it, nobody actually know or bother about my real birthday. Perhaps, I was expecting one, or maybe two, to realize that it wasn’t real. Then, it suddenly struck me… Oh no! I tried it this year on my REAL birthday. Disable the birthday notification. AND it is good to know that a handful of them actually knows. Appreciate it a lot! 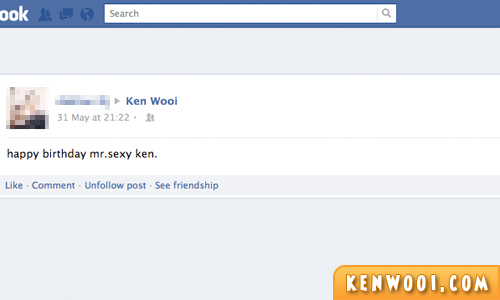 Oh well, in case I missed it, Happy becoming and belated birthday Ken! I love the experiment that you have done. But i feel bad that no one actually remember your real birthday. Hey, I didn’t wish you happy birthday also. Maybe I do remember leh? this should be sad,but i’m sorry that i laugh lol the last pic is too funny.. I agree. Your friend who remember about your birthday date might be your true friend. Actually, it doesnt important right. Birthday is just a day we borned to this world, we shud thanks and show appreciation to parents. 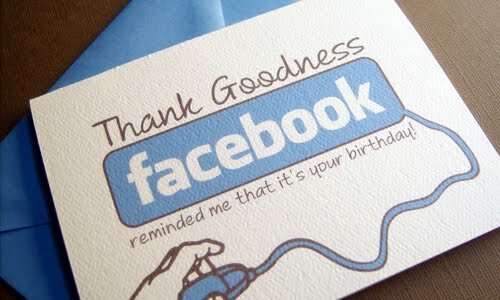 :-) and friends, who really remember ur bday, they wont wish on fb d, they will call u or straight send a text to u d. Hehe. so when is my son’s birthday? Kecian… I’ll wait for July and wish you then ok? Wah luckily I didn’t fall into the trap LOL! 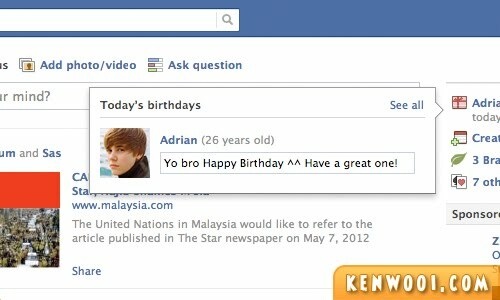 LOLZ.. people that just knowing you (few months ago), wont able to know your birthday what. Those your best friends should have beaten up. LOLOLOL!! OMG! You made a fool out of everyone! LOL!! 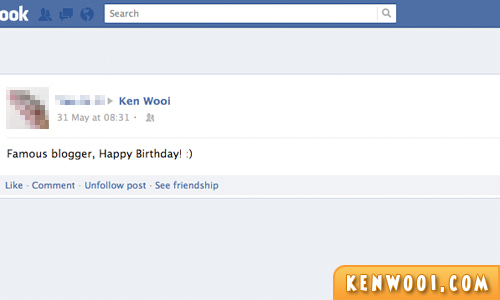 Made me a bit phobia to wish anyone Happy Birthday on FB now in case they pulled the same trick like you did haha! awhs….laughs* are you gonna put your real birthdate in July to see if the same people will wish you again? 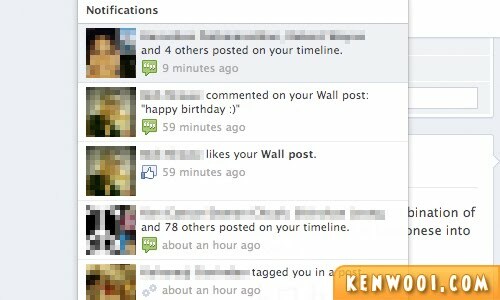 How can i disable my birthday notifications to my friends??? plzzzzzzzz help me and dooo reply……..